Getting under the skin of your site’s visitors based on its performance analytics pays dividends in identifying what content resonates most with your audience; how information is best presented on pages (content hierarchy), where to place calls to action, and what information is most valuable to new and returning visitors. Most websites we’ve come across in the B2B space use Google Analytics to monitor and evaluate their site performance. However, by digging deeper than the top level dashboard stats, you can glean much more about visitor behaviour to fine-tune your user experience (UX). By asking the right questions, you can streamline the web experience your visitors are having and improve goal conversion rates. Who are your key visitors? 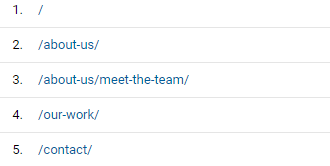 When you log into Google Analytics, entering the Audience report tells you how many people visit your site and whether they have visited before. The Geo tab offers information on where these visitors come from and what language their browser is set to. So, for example, if you have a site that is in English, but mainly has visitors from France, consider building a FFrench-specificsite or offer translations at each page level. We know where visitors have come from, but we can also learn more about how they navigate the web, which browser they use, and on what devices. Mobile browsing is becoming more popular, especially when social media updates are linked to a website. Research from Adobe found that almost eight out of ten consumers would stop engaging with a piece of content if it didn’t display well on the device they were using, so having a responsive site ensures the best experience whichever way your prospects interact with your site. 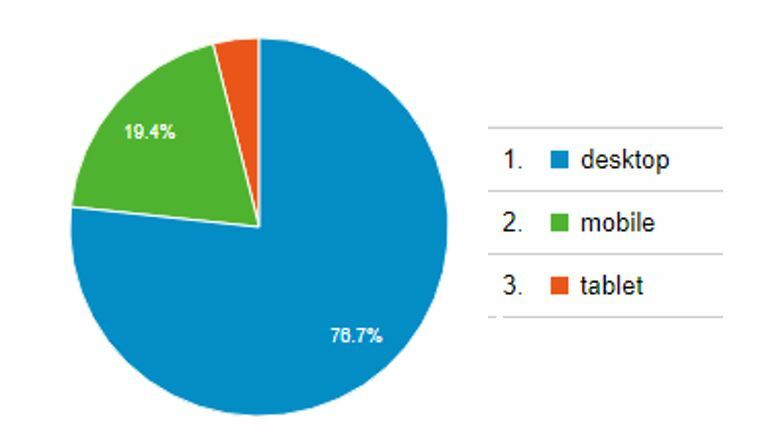 The chart of Upp’s device traffic (above) shows that almost 20% of the month’s visitors used a mobile device to get onto the site. By making our website screen size responsive, we are able to engage with this clear group of users more effectively. If you’re finding that an increasing amount of traffic has reached your site via mobile, you may even consider creating an app, especially if these visitors are frequently returning and can access premium content or a personalised portal offering extra information. How do visitors reach your site? Visitor acquisition tells you how your visitors get to your site. Whether it’s from your display ads, emails, social media or paid search, knowing how your audience gets to your site allows you to see which marketing channels are working hardest for you. If you’re putting out four emails a month but your social media, which is rarely updated, brings in more clicks, this stat will tell you where your audiences are most active and where you need to refocus your efforts. 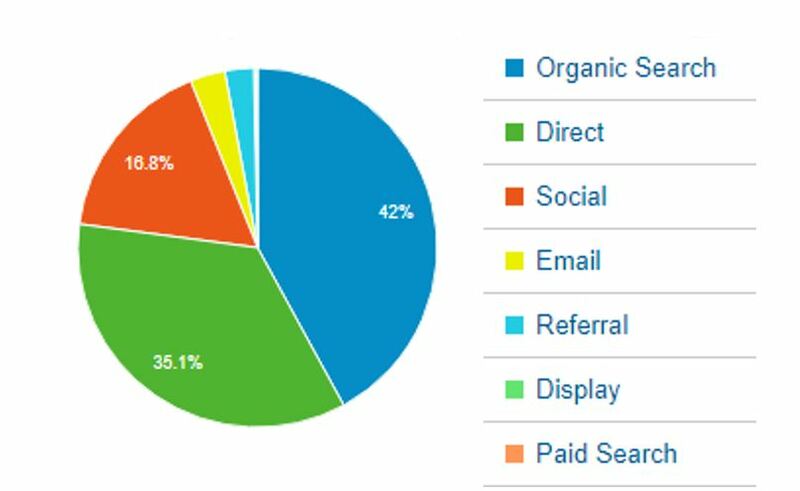 The most common traffic inbound channel for Upp (above) is organic search, where a site is found by a search engine query. Unfortunately, around 95% of search terms aren’t provided by Google due to secure web pages, a protocol that Google put in place to protect web users by creating a secure and private online experience. If your site is found through search engines, making sure it is search engine optimised is key. Read our tips for improving your b2b website performance and SEO. What do your visitors like? Finding out who your visitors are and how they get to your site is just scraping the surface of your site’s visitor behaviour. Finding out how they then navigate when they get there is critical to help you understand which pages are performing the best and which perhaps need to be rethought. It’s more than likely that the home page will be your most visited page, as all pages have a navigation back to the home page. Following that, the pages with the most views determines what is most important to your website visitors. Take a look below at the top five visited pages from Upp’s website for the past month. The second and third most popular pages were our about us and meet the team pages. Proving that we’ve either got a bunch of absolute stunners in the office, or that potential prospects want to know the kind of people they could be working with and the names of contacts they’d like to reach out to. Use this information to shape where you place your key calls to action to create a fluid user journey within your pages, leading visitors to take a relevant path through the site even when self-navigating. You can test whether this ‘user journey mapping’ is successful through setting up conversion goals. The Conversion report has the capability to show when certain actions are carried out, or a set URL is visited, such as reaching the ‘Contact Us’ page or a ‘Thank you’ page for a download. Analysing the success of these pages will show where your visitors are following the mapped journeys and which are performing best. What makes your visitors leave your site? Your site bounce rate is the percentage of people who come onto your site and quickly exit again without any interactions. Don’t be disheartened when this is over 50%, many web click-throughs are accidental clicks and your site might not be what the visitor expects when they choose to click. For a more comprehensive view, in the Behavior tab on Google Analytics, the Site Content section includes a report on Exit Pages. This lists the top pages which visitors leave your website from. Use this list to find where most of your ‘drop offs’ are happening, and then take a look at these pages with a critical eye. Are they engaging? Is the content relevant to the page title? Does the page give a visitor a clear next step to take? Some pages will be a natural end for visitors, however, if it’s a landing page, or one which features a call to action which isn’t being clicked, it’s time to assess the layout, content, or even something as simple as a change of colour for your call to action button. Here at Upp, we like to set aside some time each month for reviewing our site and how it’s performing. This allows a set time frame to compare data trends, and by comparing activity month on month, we can build a bigger picture of the success of the site page by page. 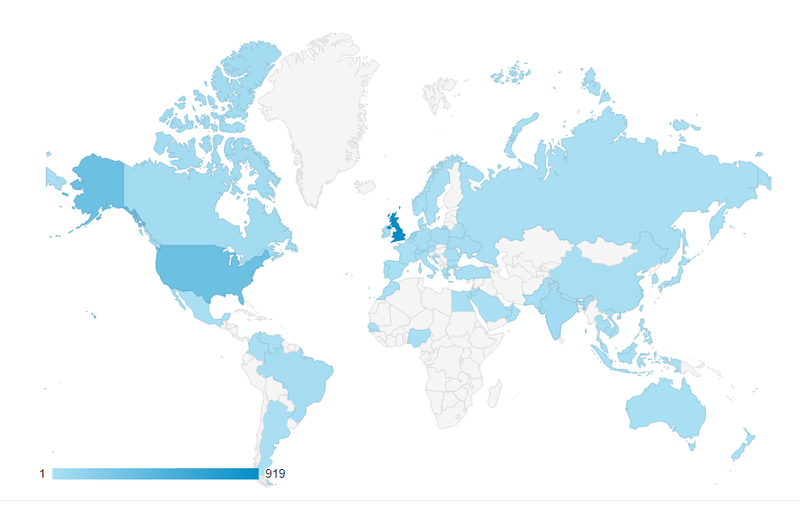 If you would like us to help you see beyond your Google Analytics then just get in touch.